Item #0053: If you eat highly cooked and processed foods, you can cause a severe enzyme drain and shortage that weakens the entire body. Enzymes are crucially involved in nearly all bodily processes, including the breakdown of food so that it is utilizable. Food heated over approximately 118 degrees is devoid of enzymes. Cooking, canning, and other processes destroy vital enzymes. So if you eat cooked food, it is essential to replace the enzymes that have been destroyed. Lack of enzymes = lack of health. High level health cannot exist without high levels of enzymes. The body places great importance on digestion, so it produces its own enzymes in the absence of any in ingested food. Yet, it does so at great expense to your health. Having to produce all of the digestive enzymes on its own drains the body and causes its production of metabolic enzymes to diminish (which can lead to disease, premature aging, degeneration, lack of vitality, and more). Metabolic enzymes include metabolic antioxidant enzymes. If enzyme-less foods (highly heated and/or processed foods) are eaten, the body's supply of metabolic antioxidant enzymes will diminish and cells can suffer more free radical damage. Free radicals are one of the direct causative agents in disease and aging, and keeping them under control is essential to health. A lack of enzymes can cause food to be only partially digested. Thus, nutrients are less available, and the undigested food is actually quite harmful to your body. Partially digested food particles can enter the bloodstream and cause problems there, such as food sensitivies and allergies. Other partially digested food particles that don't make it into the bloodstream are fermented or putrefied by bacteria, producing gas. Digestion Enhancement Enzymes significantly increase the absorption, assimilation, and utilization of food and other supplements taken with it. These enzymes also minimize toxic, partially digested (or totally undigested) food particles. A major cause of ill health is a lack of metabolic enzymes (including metabolic antioxidant enzymes), which basically make everything happen in our bodies: the higher your metabolic enzyme level, the greater your ability to cleanse, heal and regenerate. To be healthy, we need (among other things) to fully digest our food and have high levels of metabolic enzymes. The way to do this is to give your body the best nutrition you can via lots of raw, uncooked plant foods, regenerative bio-compatible nutritional supplements, and supplemental digestive enzymes. Remember: You are what you digest and assimilate; not just what you eat. 1-5 capsules per meal depending on amount of cooked food and difficulty of digestion. Animal flesh/dairy/eggs and unsoaked nuts/seeds require 5 capsules. Tofu, grains, potatoes require 2-3 capsules. Cooked veggies require 1-2 capsules. The more cooked food (or unsoaked nuts/seeds) you eat, the more Digestion Enhancement Enzymes you need to take to replace the enzymes lost in cooking. It is optimal to take Digestion Enhancement Enzymes every time you eat (more with cooked food; less with raw food). 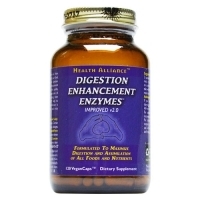 Digestion Enhancement Enzymes will digest protein, fat, carbohydrates and cellulose. Taking Digestion Enhancement Enzymes with other supplements will further enhance the absorption, and therefore utilization, of them. The healthier you live your life, the less stress there is on your bodily systems. Save $ on enzymes by eating more raw foods, and therefore requiring less of them!